Ribbon Cutting Photo Cutline: The Equity celebrated the opening of the Horace Feed Mill with a ribbon cutting ceremony at their recent Open House. Pictured are (from left) Stan Kuhns, vice chairman of The Equity Board of Directors; Congressman John Shimkus; Wade Harrison, The Equity Livestock Development; Darwin Wohltman, equity VP of Feed and Livestock; Bob Miller, secretary of The Equity Board of Directors; Robert Miller, board of director with The Equity; Paul Klingler, board of director with The Equity; Nick Jansen, chairman of The Equity Board of Directors; and State Rep. Brad Halbrook. SPRINGFIELD — Confidential crop surveys, which will soon arrive in farmers’ mailboxes from the USDA National Agricultural Statistics Service should be completed and returned in order to protect the correct implementation of farm payments and programs. This is what Mark Schleusener, Illinois State Statistician for NASS, wants farmers to know as his office prepares to release crucial surveys for finalizing wheat and oats production. Repercussions from weak producer participation in the survey not only affect the accuracy of state numbers, but county-level production as well. “Those county-level production numbers are used in a number of ways. For example, crop insurance and the farm bill programs, which use county-level estimates of production to determine farm payments,” Schleusener said. Areas that do not respond to the surveys or provide incomplete data force NASS into estimating county-level production using other data. NORMAL — A grad student in the Department of Agriculture at Illinois State University is conducting a research study for his master’s thesis related to nutrient loss and the Illinois Nutrient Loss Reduction Strategy, with the support of Illinois Corn. George Hoselton is offering the survey, which is accessible through the Illinois Corn website (www.ilcorn.org) or by contacting Hoselton at gshosel@ilstu.edu. “This study is intended to measure the farming community’s perspective on the issue of nutrient loss and the Illinois NLRS, and I am inviting your participation,” Hoselton said in a letter to Illinois Corn membership and other producers. “Your name does not appear anywhere on the survey, and the information you provide cannot be associated in any way with your name. 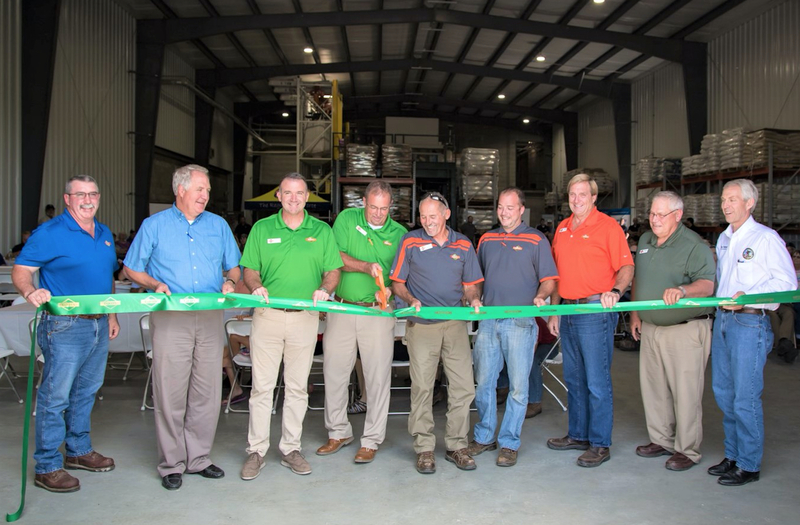 CHRISMAN — It isn’t often a new feed mill opens in Illinois, points out Tim Maiers of Maiers Ag Consulting and the Illinois Livestock Development Group, and it’s even rarer when the public is invited to its grand opening. But that is exactly what happened on Aug. 22, when The Equity hosted an open house for the new state-of-the-art Horace feed mill in east-central Illinois. The mill is designed to produce up to 450,000 tons per year of complete swine feeds, which will feed 1.35 million market pigs, according to Darwin Wohltman, vice president of feed and livestock for The Equity. “We wanted to offer a chance for the public to come out and see the feed mill for themselves and learn more about what we do here,” said Wohltman. The mill consists of three major concrete sections, including a 156-foot tall mill building, receiving and loadout building, and warehouse. Corn is supplied form an adjacent 4 million-bushel grain elevator. The mill will add demand for 6.4 million bushels of corn and 2.7 million bushels of soybeans, according to a news release. URBANA — Assessing weed control successes and failures now can help farmers plan strategies for 2019, noted University of Illinois Department of Crop Sciences weed expert Aaron Hager. “Herbicides applied in the fall often can provide improved control of many winter annual weed species compared with similar applications made in the spring,” Hager said in a recently published essay. Horseweed (or marestail) and butterweed are two plant species identified by Hager that could be controlled with fall-applied herbicides. “Targeting emerged horseweed with higher applications of products such as 2, 4-D in the fall almost always results in better control at planting compared with targeting overwintered and often larger plants with lower rates of 2, 4-D in the spring,” he advised. “Butterweed is a winter annual species that research has demonstrated essentially completes its emergence by November. In University of Illinois research, fall-applied glyphosate generally provided greater and more consistent control of butterweed compared to the same rate applied in spring. Hager’s entire essay can be accessed through the U of I farmdocDAILY website (www.farmdocdaily.illinois.edu).